Give chance to players with the fighting spirit and winning mentality. Those who have reached ‘menopause’ must be benched for us to get the three point.The mouthy muiruri will be out to spoil the zamalek triumph party in order to get cheap publicity. Let’s silence him as we always did when he was at chemelil. Good luck boys. This games are coming in unrelenting speesd so squad rotation is a Must to avoid injuries and get to understand different player partnerships. Let me today try partnering Shakava and Momanyi at the back and see how they fare together just as an option to the Joachim/Momanyi centre back pairing. If they display good footing and complenent each other well we should expect no less than a clean sheet. Muguna will partner Wendo in midfield as we require Muguna to play many games and get back into full fitness. Tuyisenge/Kipkirui partnership also need more playtime we see growth of better combination from them…. ” let me try pairing” since when did you become gor mahia coach? Stop unnrcessary insurbodination omera. If oktay is the coach let it remain so. @jasego are you gor mahia coach that you should decide who plays in that team? Wharrathese? @Akira GM squad selection and tactics/formations are directly under my portfolio so any match day team selection is done completely under my supervision as i attend training too. I do not dictate but help the coach find winning formulae’s. He himself of his own volition won’t name a squad before consulting me so where is the problem is glory is achieved…. I wish the team all the best. We should be careful cause these tail end teams have always given us problems. CafCL and CafCC. Hiyo tuu. If Vihiga forces a draw the coach will brag for a whole week. It will be about how he used Brazilian tactics to stop Gor. How he told his boys this and that. How Gor can be stopped and so on and so on… it will not stop. Inferiority complex is such a bad thing! Why would anybody think that it is a surprise Gor Mahia beat ‘mighty’ Zamalek? On the field of play what counts is the statistics and if am not mistaken, we were better in all department! Hence the win! Surprises don’t happen in football. Pedigree might count for history’s sake but in the beautiful game, you are as good as your current status and mental out put! Gor council of elders and he is very capable of advising on this matter , otherwise if am wrong on this then I wish all the best of luck with the ministry of sports and the talked about second shirt sponsor . Best of luck against Vihiga utd . The problem in Gor Mahia is tax evasion by Mugabe & Co. The kes.129m tax liability means that KRA has a caveat on all funds transferred into GM bank accounts be it CAF/SP. That’s the main reason why AR operates opaquely for he can’t justify the KRA mess. Marketing, marketing, marketing. A photo of the Zamalek goalie sprawled and his last man literally seated on the grass while Oliech is towering over them with the ball on it’s way to the net, is bound to be very enticing. J’Asego I would rather try pairing Momanyi with Joash than with Shakava. As you ponder future signings, please take a look at Bandari’s jersey No. 24, Ugandan William Wadri. That is an AM per excellence. Meanwhile see towards giving Godfrey Ochieng’ some play time. I would rather have J’Asego “insurbodinating’ the coach, but we get good results than give the coach a free hand and end up with the team losing even to minnows like KCB. S“I have told my players to put more effort to look for the maximum three points having in mind we will be playing at home. 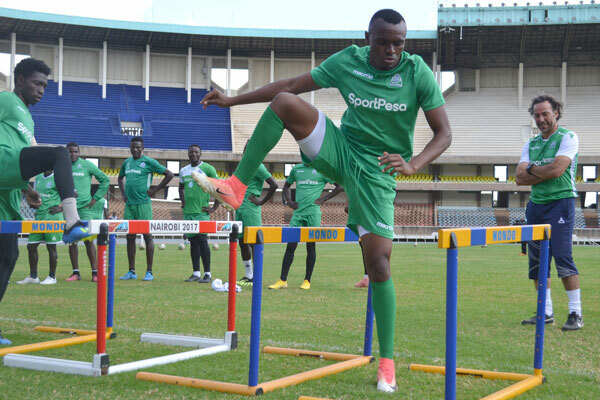 Gor is just like any other team which can be beaten,” Mururi said. Soldier on J’Asego. Ignore the detractors who have never appreciated anything done out of the box. The line has turned out to be as you had suggested earlier and we are now leading 0 -1 at HT.